Seeing the Great Wall is an incredible experience. You can’t help but be amazed at the ingenuity, hard work, and bravery. From Gobi deserts to the East Seas the Great Wall changes that also changes the experience of visiting this largest man made structure. If you go to the popular areas such as Badaling, the Wall will look just as it does in the pictures… being restored into incredible examples of the former wall, crowded with thousands of tourists and hundreds of tour buses on holiday seasons. But in the Wild sections, you’ll see the wall as it really is today….deteriorated and overgrown. It’s usually a tough climb to get to the wall, and then you have to bushwhack your way along the path. But it’s definitely worth the effort. You come, you climb, you conquer! In a more original state than the sections closer to Beijing, Wild Great Wall in this area is not restored at all or partly restored. Not only that, you may see ONLY 10 other tourists during your entire Wild Great Wall day hike. To make things more interesting, in this area, Wild Great Wall climbs high atop the ridge of a mountain, where at some points, because of the sheer cliffs on both sides of the Wall, the Wall is only a few feet wide. At many parts, the Wild Great Wall is broken, steps are missing and trees grow on the towers. Spending a day hiking up Wild Great Wall, here, will leave you inspired and amazed at how, hundred of years ago, people made it to such remote regions and built such an unbelievable structure. Among 629 kilometers long Walls in Beijing, 600 kilometers of them remains “wild”, untouched, steep slopes and majestic scenery in the face of China’s rapid development. The Wild Great Wall generally refers to Jiankou, Simatai, Jinshanling, Huanghuacheng and Gubeikou Great Wall around Beijing. Here, Wild Great Wall attracts thousands of adventurous tourists and photographers every year who want a more “authentic” Great Wall experience. Wild Great Wall has become ideal sites for excursions, hiking, trekking, climbing and shooting photos. You will find more than 65.5 kilometers of Wild Great Wall that spread within Huairou District of Beijing. Several historic sections of Wild Great Wall in Huairou are already known to tourists, inlcudingHuanghuacheng Great Wall and Xishuiyu Great Wall at Jiudu River Town, Jiankou Great wall, Xiangshui Lake Great Wall and Qinglong Gorge Great Wall at Huaibei Town. The famous jagged cliffs and steep drop-offs make Jiankou the most inaccessible and dangerous to climb. Wild Great Wall actually crosses through Huaibei, Yanqi, Bohai and Jiudu River, the four main towns at central southern part of Huairou District. Wild Great Wall at Huairou District was first constructed in the mid-6th century in Northern Qi Empire. While many of Walls we can see today were rebuilt duirng the Ming dynasty. Some sections of Wild Great Wall were constructed within Emperor Yongle and Emperor Jingtai of Ming Dynasty. From 1993, restoration projects and recovery plans have been carried out within Huairou District of Beijing. Funds were allocated by government departments concerned to repair the Great Wall. By far an overall 8.9km (5.5miles) of Wild Great Wall have been restored and repaired. If you happen to be travelling in China and visiting the Great Wall, Besides the popular renowned Great Wall in and around Beijing such as Badaling, Juyongguan, you’ll find many Wild Great Walls worth for a visit such as Jiankou, Jinshanling, Gubeikou, Simatai andHuanghuacheng. Hiking & camping on Wild Great Wall are more like adventurous journey. However, Wild Great Wall adventure by no means is a torture. It’s a way to enjoy the beauty of the surrounding landscape. It’s a way to challenge yourself. It’s a way that you’ll learn more about the world and yourself. While being able to witness the wisdom of ancient Chinese for the construction of the Great Wall, you’ll be able to climb up mountains and make yourself close to history and the true mother of nature. 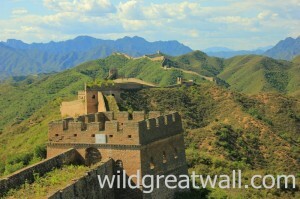 By passing throught it on foot, Wild Great Wall is probably where you will find youself.